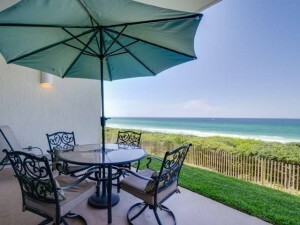 Seacrest Beach gulf front condo for sale. Located just west of Rosemary Beach in the gulf front complex of High Pointe Resort this ground floor unit features 2 bedrooms, 2 bathrooms, expansive gulf views, direct walk out to green space, and 1,315 sq. ft. of heated and cooled space. High Pointe Resort is a gated community that offers a lagoon pool, on-site security, exquisite landscaping, playground, tennis courts, and so much more! Contact one of our expert agents today to schedule an appointment to see this Seacrest Beach gulf front condo. Contact us at The Beach Group at 850.231.9007 for more information on Seacrest Beach real estate.